Get a Thermal Home Inspection and Go Deeper. 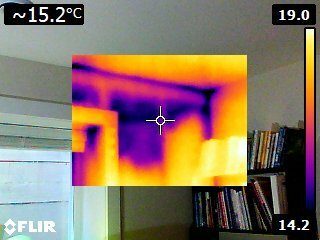 Thermal imaging is a non-invasive, non-destructive way of evaluating conditions when performing a home or commercial inspection. Defects such as moisture / water defects from roof and wall leaks, overheating and unsafe electrical defects, air leaks, missing insulation all can affect the surrounding temperature. Thermal / Infrared imaging / photography can reveal these and other issues that cannot be seen by the naked eye or with conventional or digital photography. Our best inspection – for a separate or additional fee (call for quotation). Considerations for time of day and other preparations are needed. The Thermal Home Inspection can identify Moisture intrusion and leaks can’t hide from infrared scanning. Fresh paint can cover up stains, but moisture stands out. Does your home or office / industrial building leak? We can scan to locate and confirm leaks with professional Infrared equipment and industry standard moisture meters. 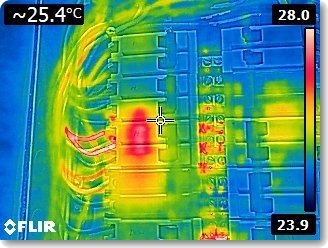 Have you had your electrical panels scanned? Do you have defects that have not yet become obvious such as overheating connections and other electrical faults? Under load, conductors and terminals may heat up to unsafe temperatures which go unnoticed by most Home Inspectors. We scan all panels in the home under load, creating a clear view of your electrical system’s health. Missing Insulation and energy loss, such as leaking ducts or unsealed gaps rob you of your energy dollars. Brand-new construction homes often have areas of missing/removed insulation which can cause cold spots in the home, as well as weatherization issues which can create drafty areas around the house. Identify these hidden problems with ease with a Thermal Home Inspection.